As someone who takes Prozac, due to OCD, this is of interest. It does demonstrate how drug companies effectively push their products onto the public without a proper explantion of the mechanisms by which they work. In my case I've never believed that OCD is caused by low levels of seratonin, merely that any boost in seratonin levels improves mood and therefore symptoms are lessened. Behaviour therapy is far more effective in terms of OCD than Prozac. Much research has demonstrated that brains of OCD sufferers are anatomically different to non sufferers. It's not chemical, it's anatomical. For years drug companies and doctors have been convincing people they have some kind of defective Brain chemistry that need to be corrected by drugs, much like diabetes or hypothyroidism, however there is no real evidence that it's the case. If you've seen a doctor about emotional problems some time over the past 20 years, you may have been told that you had a chemical imbalance, and that you needed tablets to correct it. Yep, agree with you. We are always being told how little we actually know about how the brain functions and yet drug companies would seem to know exactly how complex behavioural and emotional problems work to be able to 'solve' such issues with the drugs they formulate. As you say, the function of many such drugs is to alter mood states and mask the symptoms rather than directly targetting the underlying issue which is probably still largely unknown. although ideas like the serotonin theory of depression have been widely publicised, scientific research has not detected any reliable abnormalities of the serotonin system in people who are depressed. So basically the theory is is poo, with no proof, but the doctors still tell patients [like my friend] that she must take them permanently because she is deficient in seratonin. Cobblers! Just a way for drug companies to ensure the sale of their product. We know why doctors push certain drugs don't we. In the states, payments to doctors from drug companies are as high as $57 billion per year. Even bribing doctors with cars. This is the states, so what happens here??? Multinational drug companies are targeting doctors in developing countries with dinners and lavish gifts, such as air conditioners, washing machines and down-payments on cars, as incentives to prescribe their drugs, a report reveals today. Drug companies are paying nurses to visit hospitals and doctors’ offices in the U.K. to review charts and chat with patients, Jeanne Whalen writes in this morning’s WSJ. The industry says the programs can improve care for people with chronic illnesses such as diabetes or asthma, but critics say they may violate patient privacy and serve as a pretext for drug makers to push pills. One recent 18-month program sponsored by Pfizer and the National Health Service added nurses to hospitals to discuss management of chronic health conditions with patients. Sanofi-Aventis is paying nurses to train doctors’ office staffs how to identify patients at risk for cardiovascular disease and diabetes. Last fall, the British drug trade group temporarily suspended Merck after ruling that a company program in which nurses paid by Merck reviewed patients’ charts inappropriately promoted Merck’s blood pressure drug Cozaar. The companies are “doing this on the hope that they will get their fair share of prescriptions out of it,” the head of a company that provides nurses for the projects told the WSJ. The practice is also becoming more common in Belgium, Germany and Ireland. 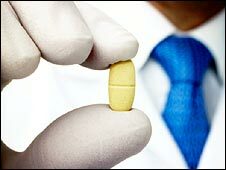 This week we hear that GlaxoSmithKline has been paying doctors to switch patients to a newer, and more profitable, drug. This is common practice, of course, and it's the reason why drug companies are so profitable. In fact we've estimated that over 30 per cent of profits are derived from new products. But how do you get patients to try the next best thing when they've been on an older drug, possibly for years, and without suffering any nasty side effects?